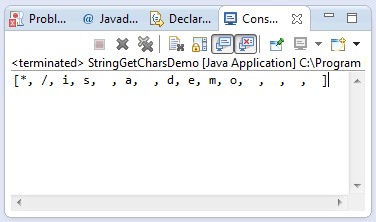 This java tutorial shows how to use the getChars() method of java.lang.String class. This method returns void. The getChars() method of String class generally copies character from this string to the target character array object. This example source code demonstrates the use of getchars() method of String class. The example also made use of the length() method of String class which generally get how many characters the source string is. The length has been used as the srcEnd parameter which means we are getting the characters starting from the srcBegin up to the end of the source String. We have also instantiated a new character array for the target char as parameter of our getChars() method.